Configuring your fireplace is an unlimited as your imagination! Styles range from rustic, to contemporary and everything in-between. There are only a few things to consider when working on the design. Entertaining in the outdoors of Oklahoma City has become an important aspect of home ownership. People are dressing up their back patios with beautiful furniture, outdoor kitchens and televisions. 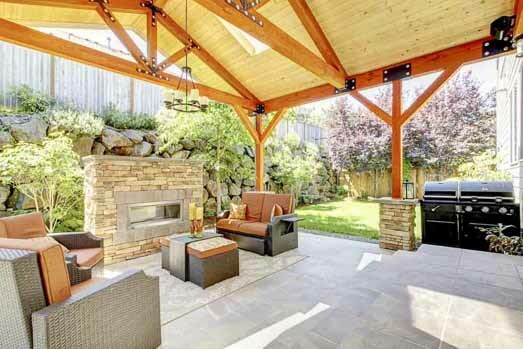 Building a backyard fireplace is an easy way to boost the usefulness of your outdoor living area, as well as adding a charming focal point to your backyard. 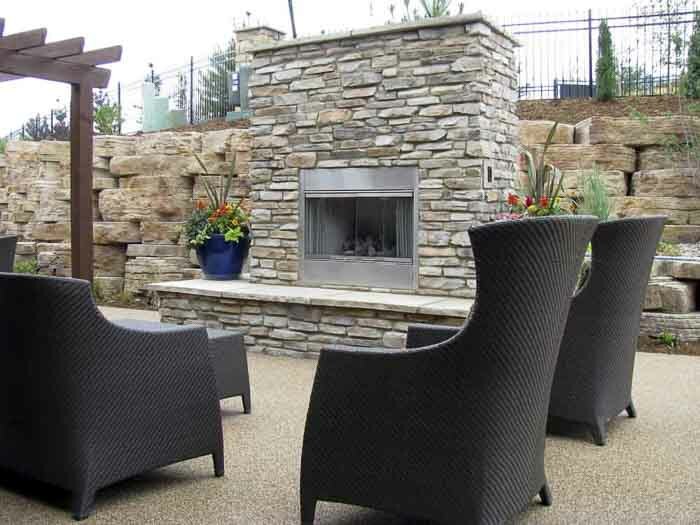 Home Value – Believe it or not, an outdoor fireplace can add value to your home. Any improvement that not only, ups the ‘wow’ factor of your home, but also its functionality increases its value. This is advantageous to your personal enjoyment of the home, and helps with resale in the future. Increased Living Space – What homeowner doesn’t want to increase their living space? 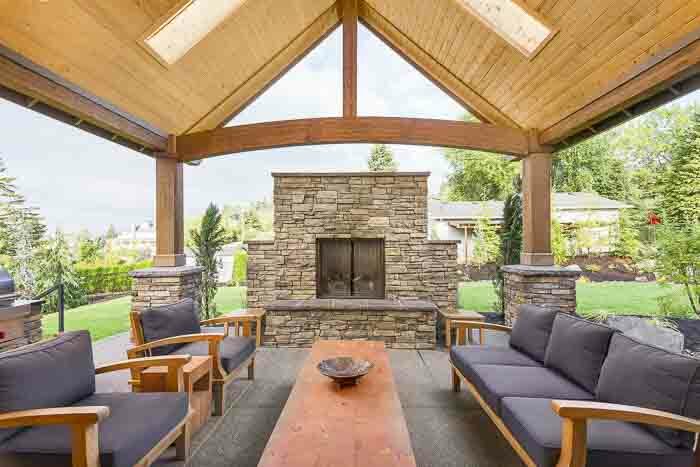 Most outdoor fireplaces are built on an existing patio slab, or a slab that has been poured to make a larger outdoor living space. 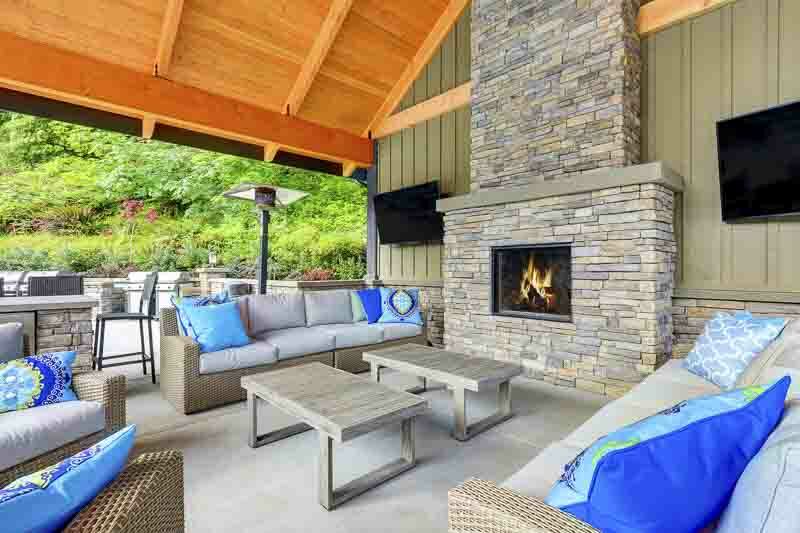 Outdoor furniture, outdoor kitchens, and outdoor fireplaces all help create a functional entertainment area not only for your family, but guests as well. 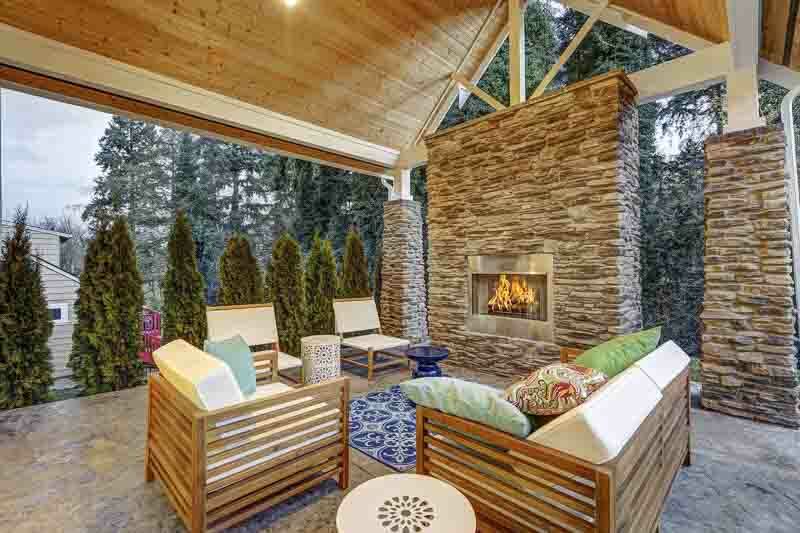 Enjoy the Fresh Air Twelve Months a Year – Cold weather is no match for a roaring backyard fireplace, and as most Oklahomans know, our winters can get pretty chilly. 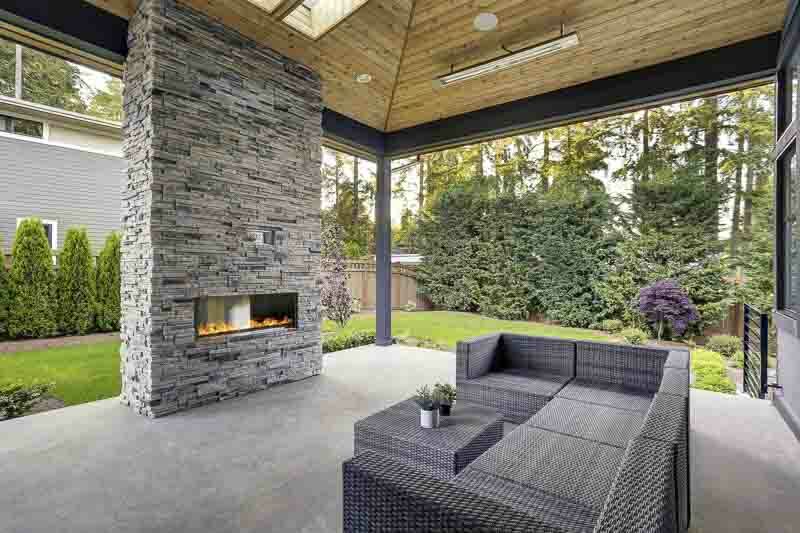 Extend your outdoor time with a fireplace that warms your patio, and allows you to get some much-needed fresh air during those stuffy winter months. 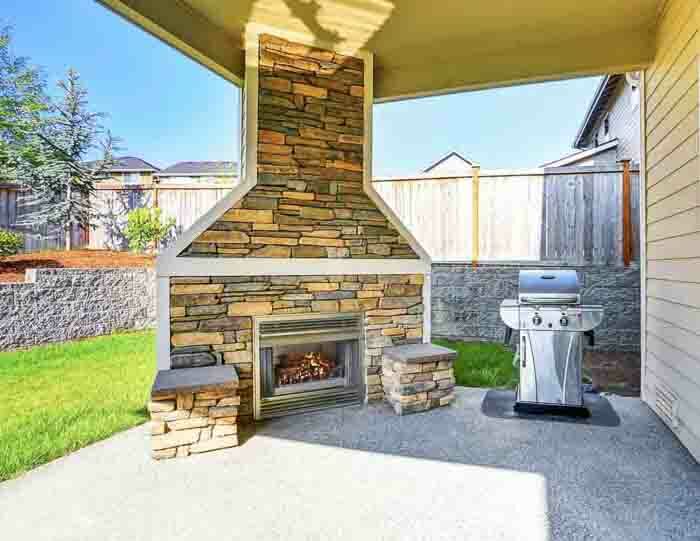 If you have an outdoor kitchen, then the warmth from your fireplace will also make your outdoor cooking easier and more enjoyable. Backyard fireplaces can be fueled by different sources, and it is important to decide which source works best for your environment. Natural Gas – This type of fuel source can be very inexpensive and easy to use. If your patio has a current gas line, then it can be run beneath or around your slab and tied into your new fireplace. This allows you to easily start your fire using either real wood or gas logs. If your patio needs a gas line, our outdoor experts can easily install one for your fireplace, or an outdoor kitchen. Propane – While not a traditional fuel source for fireplaces, propane can be utilized to fuel your fire. A disadvantage of propane is the need to replace the tank when it runs out. Electric – Electric fireplaces are extremely easy to light, since you just flip a switch. A licensed electrician must run electricity from your home to the fireplace, so this can entail some work. Either source is cost effective and viable for your ‘ease of use’. Your fireplace should not only be enjoyable but simple to operate. There are unlimited design choices when it comes to selecting your fireplace. Tall, small, rock, brick, the choices are unlimited. Handcrafted masonry fireplaces can be built in any shape or design and are designed to accentuate your home and create a ‘living area’ that can be enjoyed in the beauty of nature. And thanks to Pinterest, there are ideas galore! Designing your fireplace starts with the actual material itself. Depending on the ‘look’ you are wanting to achieve, there are several options that are available. All materials used in the masonry construction are fire and weather resistant. Natural materials such as stone, marble and brick are extremely hardy and can last for years and years. Fireplaces can be any size that works well within your budget and plan. They can be built on your current slab, next to it, or out in your yard. 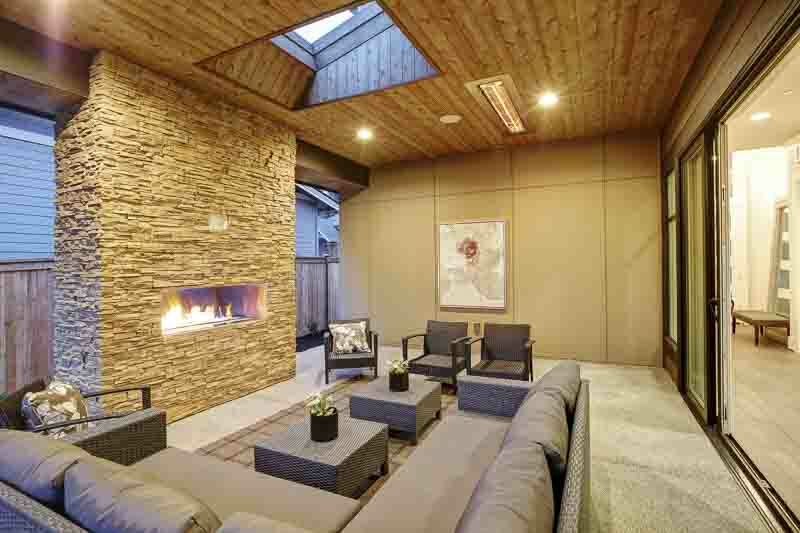 Many backyard fireplaces are tied to your existing patio roof. However, they can also be freestanding if you do not have a patio cover or wish it to be a standalone. They can range from small to extremely large depending on your budget. Size, materials and extra work (such as electrical) all determine the price, which is why your contractor will work closely with you to make sure you get the fireplace that makes you happy and stays within your budget! Servicing Oklahoma City, Edmond, Norman, Moore and the OKC Metro. Call us today to get connected to a local contractor!